Adjusting your printer’s settings includes choosing paper quality and selecting the pages to print. You adjust your printer’s settings in the Print dialog box. The Print dialog box, shown in the following figure, lets you route your work to any printer installed on your computer or network. 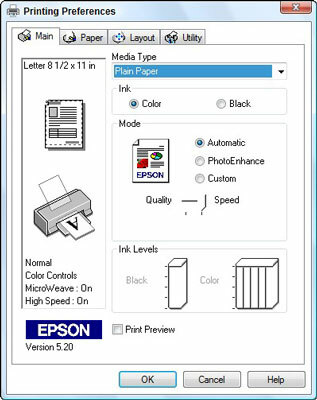 While there, you can adjust the printer’s settings, choose your paper quality, and select the pages you’d like to print. Adjust your printer’s settings in the Print dialog box. Select Printer: Ignore this option if you have only one printer because Windows chooses it automatically. If your computer has access to more than one printer, click the one that should receive the job. Page Range: Select All to print your entire document. 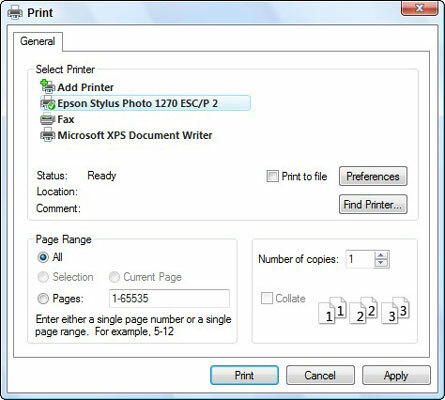 To print just a few of its pages, select the Pages option button and enter the page numbers you want to print. Number of Copies: Most people leave this set to 1 copy, unless everybody in the boardroom wants their own copy. You can only choose Collate if your printer offers that option. Preferences: Click this button to see a dialog box like the one in the following figure, where you can choose options specific to your own printer model. Use the Printing Preferences dialog box to change settings specific to your printer, including the paper type and printing quality.